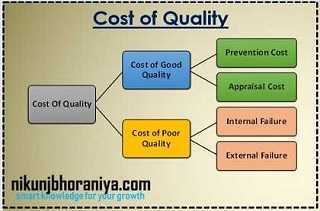 → Cost of quality is to quantify the total cost of quality-related efforts and deficiencies. → Prior to its introduction, the general perception was that higher quality requires higher costs, either by buying better materials or machines or by hiring more labor. → It is a methodology that allows an organization to determine that its resources are used for activities that prevent poor quality or create good Quality. 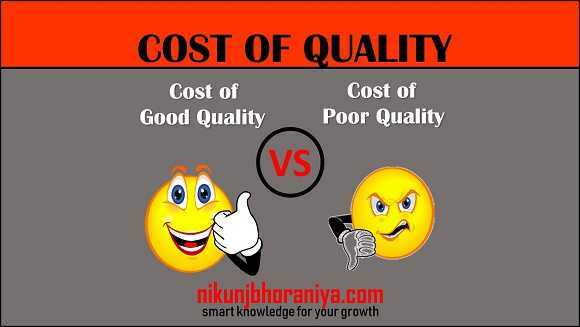 → The Cost of Poor Quality is the costs associated with providing poor quality products or services. 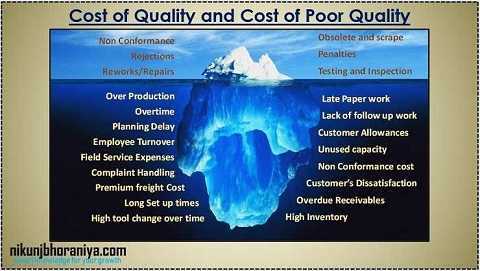 → Cost of poor quality (COPQ) are costs that would disappear if systems, processes, and products were perfect. → It is a refinement of the concept of quality costs. → Prevention costs are incurred to prevent or avoid quality problems. → These costs are associated with the design, implementation, and maintenance of the Quality Management System. → They are planned and incurred before actual operation, and they could include. → Appraisal costs are associated with measuring and monitoring activities related to quality. → Internal failure costs are incurred to remedy defects discovered before the product or service is delivered to the customer. → These costs occur when the results of work fail to reach design quality standards and are detected before they are transferred to the customer. → Waste - performance of unnecessary work or holding of stock as a result of errors, poor organization, or communication. → Rework or rectification - correction of defective material or errors. → Failure analysis - activity required to establish the causes of an internal product or service failure. → External failure costs are incurred to remedy defects discovered by customers. → These costs occur when products or services that fail to reach design quality standards are not detected until after transfer to the customer. → Repairs and servicing - of both returned products and those in the field. → Warranty claims - failed products that are replaced or services that are re-performed under a guarantee. → Complaints - all work and costs associated with handling and servicing customers’ complaints. → Returns - handling and investigation of rejected or recalled products, including transport costs.